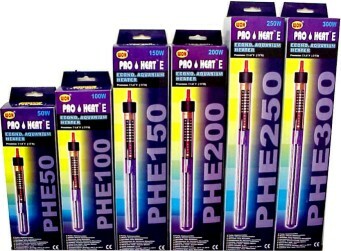 PHE glass heater is one of the best selling heater that can use with 115 volt / 60 hz. This heater is a economic heater. This heater can be set temperature with seeing a visible temperature wetting indicator by turning temperature adjustment knob on the top part of heater head. This heater has ON / OFF indicator that shows heating mode or stop mode of heating. When set temperature is reached, the On / OFF indicator will not be illuminated. If water temperature drops below set temperature, the heater will automatically turn on to heat water. At this time ON/OFF indicator light will be illuminated. This heater was manufactured with double insulation for water proof and very reliable circuit, thermostat and high quality quartz has been used to ensure the high quality heater. This heater is very safe and reliable as well as it can be used in both fresh and saltwater aquarium. The calculation of approximate heater guide only apply to tank with well insulated bottom and covered top. If the tank is not well insulated or the top is unable to be used to cover the tank due to hang filters, air pumps or any other material that does not allow for a top to be used, it should be noted that heat loss will occur. To compensate for the heat loss, increase the wattage moderately.